Adem Mripa is warming his hands on a bonfire of cardboard boxes and wooden planks - it is a bitterly cold evening in Kosovo. By day the ethnic Albanian is the deputy head of a local school but by night he is part of an unofficial neighbourhood patrol. ''We are committed to staying here even though we are experiencing tremendous pressures from the Serbs living next door to us,'' Adem says. Adem lives in a Serb part of the ethnically divided town of Mitrovica. He is joined around the fire by other neighbours who all stand out on the streets after dark guarding their homes. Just a couple of nights ago a hand grenade exploded in the area. ''Last month they were shooting at the window of the room where my kids were sleeping," Adem tells me. Since independence was declared a year ago on 17 February 2008, ethnic tensions have continued to smoulder in Mitrovica, which is the main town in the Serb-dominated north. Some Kosovo Serbs complain of intimidation, and feel trapped in their towns and enclaves as they do not feel safe in ethnic Albanian areas. There has been sporadic violence. When trouble flared here back in March, a UN policeman was shot dead. A year on from its self-declared independence, Kosovo has a new constitution and it is run by the government here instead of the UN. But there is no sign that the government in the capital Pristina is able to assert its power over the north of Kosovo, which is around a quarter of the territory. Last month a Nato-trained Kosovo Security Force was launched. 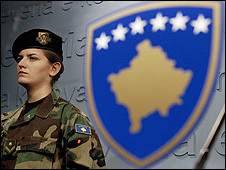 It replaced the Kosovo Protection Corps, which consisted mainly of veterans of the independence struggle against Serbia. The new force, which will be more than 2,000-strong, is supposed to be multi-ethnic - but so far just six Serbs have applied to join. Independence day will be ignored by Kosovo Serbs. Supported by Belgrade, they say that Kosovo is still part of Serbia. ''We've had a quite tense situation since 17 February 2008 because Serbs didn't recognise the independence but the Albanians thought everyone should recognise it," says Oliver Ivanovic, a moderate Serb leader and Serbian government official. He denies Serbs present any real threat to security and urges both sides to keep calm and avoid inflammatory statements. "This is a small piece of land and just 60,000 Serbs live here - it means they are not a threat to anyone," he says. In the run-up to the anniversary, some EU police officials took part in their first joint training session with some of the 15,000 Nato peacekeepers in Kosovo. 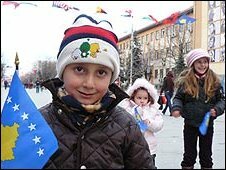 The EU launched its largest ever civilian mission in Kosovo in December. Its main role is not to police Kosovo but to monitor, mentor and advise in the areas of police, customs and justice. Working alongside the customs service, EU officials are now based at the border and some of them work in mobile units which travel around the area. At the Merdare border crossing with Serbia, a team of three EU customs officials turn up unannounced. They watch as random checks are carried out on a long line of cars and lorries. Last year in retaliation for the declaration of independence, Kosovo Serbs burnt down two of the customs posts. A radical Kosovo Serb leader has said this should be done again to mark the anniversary. ''I've got officers on those gates, we are very concerned for their safety and the threat to burn the gates down again," says Paul Acda, head of Customs for the EU mission. One of the biggest challenges for the Kosovo authorities is how to deal with Belgrade and the Serb-dominated north which refuses to accept the authority of the Kosovo government. Due to objections from Serbia, the EU mission (known as Eulex) was delayed for months and is still not yet fully operational. The top international envoy in Kosovo is Pieter Feith, the International Civilian Representative; his role is to oversee the implementation of independence plan. He says the north is a particularly serious problem. ''There is an entrenched criminal network and there are leaders without legitimacy and this needs to be addressed sooner or later," says Mr Feith. "We have the Eulex rule of law mission deployed into the North but I think it's fair to say that to be efficient they need further co-operation with Belgrade. He admits the situation is fragile. ''We have seen over the past few weeks incidents of violence and it may erupt again very soon so it's extremely unstable and we need to find a solution for this once and for all," he says. But Kosovo Serbs are angered by the focus of the international community on the north, saying that that organised crime is not just limited to the Serb areas, and pointing out that their leaders were democratically elected.